We love items that are both pratical and decorative! Our Tuscan Scrolling Iron Quilt Rack is just that. With a rustic and graceful styling, this piece grabs your attention. 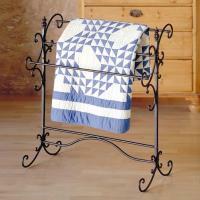 Decorative scrolled metal exudes beauty and provides useful storage for quilts and comforters. This beautiful blanket rack is a perfect accessory for your bedroom or living room. It is a great gift idea too! For more details visit www.cheapchicdecor.com.